In the past few years, horticultural citrus grove management practices have changed significantly in Florida. It is a common observation across the state that huanglongbing (HLB)-affected trees respond well to complete and balanced nutrition programs. Therefore, citrus growers are currently focusing on intensive management of irrigation and nutrition. HLB-affected trees suffer a significant root loss. In some cases, up to 80 percent root loss has been observed. Nonetheless, the roots of HLB-affected plants are functional and efficient in nutrient uptake. But due to reduced biomass and surface area, the amount of nutrient absorbed by roots is limited. Application of large volumes of fertilizer or water are therefore likely to leach out of the root zone before the tree can absorb them. Hence, application of small and frequent doses of fertilizer and water is recommended to improve nutrient availability and potential absorption by the tree. A fertilizer program should include a balanced supply of all the essential nutrients. Every nutrient is indispensable; an excess or deficiency of any single nutrient can adversely affect tree performance. Foliar application of certain nutrients can be beneficial for the tree, especially when dealing with a known nutrient deficiency, but the focus should be on an all-nutrient soil-applied fertilizer program. The soil-applied nutrients are absorbed by the roots along with the water uptake, so mobile (e.g., nitrogen and potassium) and immobile (e.g., boron, zinc, iron and calcium) plant nutrients are distributed throughout the plant as needed. It is important to ensure that the fertilizer is available to the trees year-round, since the growth season is long in Florida. When applying fertilizer, the focus should be on the 4Rs (right source, rate, timing and place) of plant nutrients. However, with a soil-applied fertilizer program, another factor that is as important as the 4Rs is soil pH. Soil pH of the root zone is a very critical factor that affects nutrient availability and uptake. Most of the micronutrients become less available at higher, alkaline (pH>7.0) soil pH and reach toxic levels at low acidity (pH<5.0). Many Florida soils and irrigation waters are alkaline, which can limit nutrient availability if not corrected. 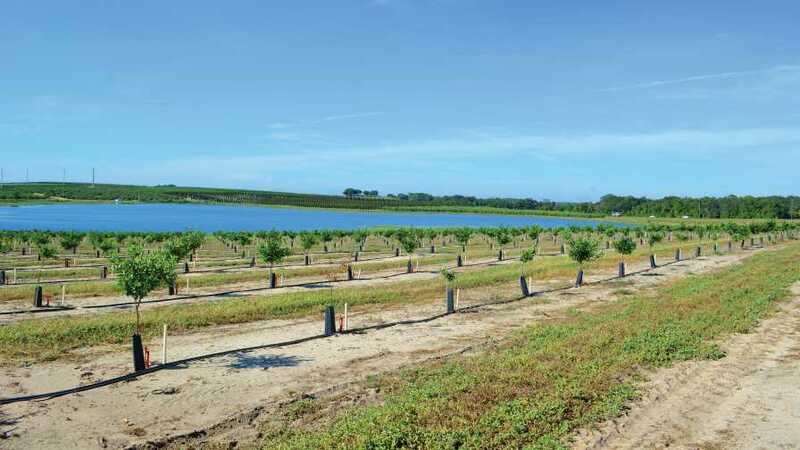 In addition, irrigation water in Florida is often high in bicarbonates, which after long periods of use can increase soil pH, affect tree health and reduce yields. The increase in soil pH and effect of bicarbonate-rich irrigation water depends on the bicarbonate concentration in the water, irrigation timing and quantity, the buffering capacity of soil and the rootstock variety. https://crec.ifas.ufl.edu/extension/trade_journals/2015/2015_May_bicarbonates.pdf.) Therefore, most growers are currently using some method to reduce the soil pH. The interaction between soil bicarbonates, pH and HLB is still unclear. Whether the bicarbonates increase the soil pH and therefore reduce the nutrient availability to the tree, or whether the presence of disease causes physiological changes to the tree remains to be answered. It is noteworthy that the soil bicarbonates in Florida have always been present, but pre-HLB tree performance was acceptable, even with alkaline pH-susceptible rootstocks. To better understand this interaction, we conducted an irrigation experiment with healthy and HLB-affected plants. The experiment was performed in a greenhouse because it is nearly impossible to keep trees free of HLB under open-field conditions. Healthy and HLB-affected Midsweet orange trees grafted on Kuharske rootstock were grown in potted grove soil. Plants were irrigated with water at pH 5.8, 7.0 or 8.0 every two to three days. The pH of irrigation water was adjusted with sodium phosphate buffers. The tree performance was monitored over a period of 60 days. HLB-affected plants watered with pH 8.0 showed more than 80 percent leaf drop; healthy plants dropped about 60 percent of leaves (Table 1). About 40 percent of HLB-affected trees irrigated with pH 8.0 water died within 60 days. 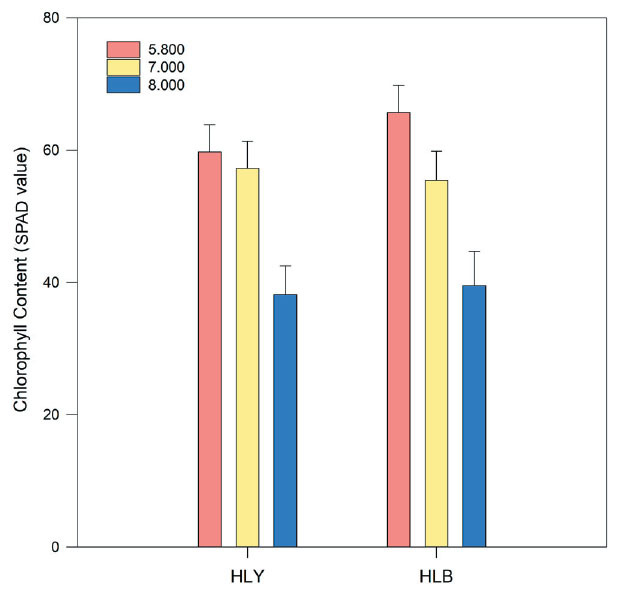 The leaf chlorophyll index decreased with higher pH (Figure 1) in both HLB-affected and healthy plants. No significant differences in total root biomass were observed with different irrigation water pH. 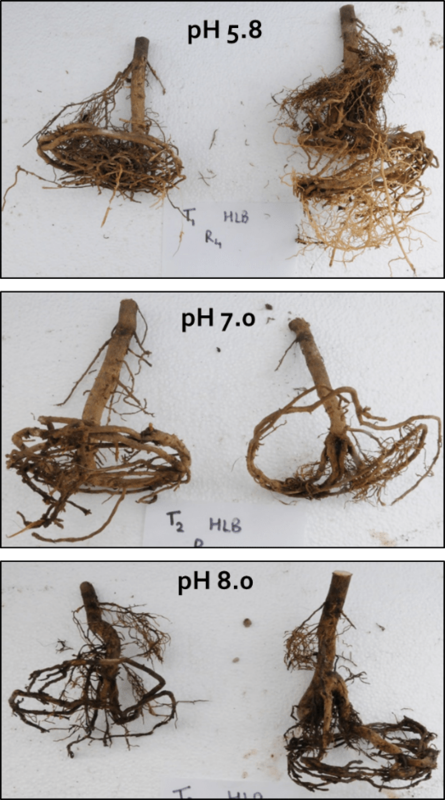 However, Figure 2 shows that plants irrigated with higher pH water had less visible feeder roots compared to pH 5.8. At the end of the study, it was observed that the HLB-affected plants irrigated with pH 5.8 water showed more growth than the healthy plants. When irrigated with water at pH 7.0, leaf drop and stem dieback were apparent in HLB-affected plants, but healthy plants were less affected. With irrigation water at pH 8.0, both HLB-affected and healthy plants showed leaf drop and stem dieback, but these observations were more pronounced in HLB-affected plants. Leaf nutrient analysis revealed that all the nutrients were in the optimum range for healthy and HLB-affected plants irrigated with water at pH 5.8 and 7.0. HLB plants irrigated with pH 8.0 showed deficiencies for magnesium, calcium and zinc, while other nutrients were in the optimal range. Even though plants were watered at three different pH levels every time, the soil pH did not change dramatically, and remained close to 7.0. As the experiment progressed, the soil pH changed slightly depending on the irrigation water pH. This suggests that the soil buffering capacity and the rootstock have a major role to play in soil pH adjustment. So any efforts to manipulate soil pH should be for the long term and will require patience. Overall, HLB-affected plants perform better when irrigated with low pH (moderately acidic) water. In the study, there was an interaction between HLB-affected plants and soil pH. The HLB-affected plants tended to perform better when soil pH was close to 6.0. When pH was above 6.5 to 7.0, the HLB plants began to decline. Healthy plants performed well at a wider pH range (6.0 to 7.0). Currently, we are conducting in-depth analyses to understand this interaction of soil pH and disease severity. Acknowledgements: This work was supported by the Florida Citrus Initiative and the U.S. Department of Agriculture’s Specialty Crop Research Initiative. Tripti Vashisth and Davie Kadyampakeni are assistant professors, and Lushan Ghimire is a horticultural sciences graduate student — all with the University of Florida Institute of Food and Agricultural Sciences. GAINESVILLE, Fla. — Growers of one of Florida’s signature citrus crops, the grapefruit, may see more production and possibly less of the deadly citrus greening disease. Researchers have worked for four years, growing grapefruit under protective screens on a 1-acre experimental plot of trees at the University of Florida Institute of Food and Agricultural Sciences, and they’re seeing encouraging results. UF/IFAS scientists and a few commercial growers have used the system, known as “CUPS,” or “Citrus Under Protective Screens,” for a few years. They’re trying to keep the dangerous Asian citrus psyllid away from citrus trees. Infected psyllids can transmit the deadly greening disease to citrus. So far, so good. They’re noticing higher grapefruit yields and no psyllids or greening. Florida grapefruit production has been drastically reduced by citrus greening, also known as Huanglongbing (HLB). In Florida, grapefruit production has gone down from 40.8 million boxes in 2003-2004 to 4.9 million boxes in 2018-2019, according to the USDA. Arnold Schumann, a UF/IFAS soil and water sciences professor, leads the “CUPS” experiment at the UF/IFAS Citrus Research and Education Center in Lake Alfred, Florida. And right now, he sees reason for optimism. Schumann is studying how well grapefruit grows in the 1.3-acre facility at the CREC. Four years of data show grapefruit that exhibit no signs of greening, Schumann said. Researchers planted ‘Ray Ruby’ grapefruit trees in August 2014. By December 2018, the trees had produced 2,100 boxes of grapefruits per acre, Schumann said. That’s 525 boxes per acre per year on average, but Schumann notes that trees are less productive in the initial two years after planting. In years 3 and 4, the CUPS grapefruit yields were 797 and 892 boxes per acre, respectively. Currently the average yield for Florida grapefruit is about 166 boxes per acre per year, according to the USDA. The CUPS experiment at the Citrus REC has demonstrated that nearly all those harmful effects of HLB can be addressed, Schumann said. “During the past five years, we have learned much about optimizing horticultural practices and pest and disease management for red grapefruit grown in CUPS,” he said. Scientists focus on producing high yields with premium grades for the fresh fruit market. One reason for the good yield is the grapefruit’s ability to adapt to the higher daytime temperatures under the protective covers, he said. A hydroponic system with trees growing in pots, instead of soil and inducing early, large blooms. Drip fertigation – a combination of fertilizer and irrigation — applied several times a day. CUPS hydroponic grapefruit has all the important attributes for fresh fruit production: high yields of HLB-free fruit, large fruit size, consistent yields and early maturity, Schumann said. “The experiments at the CREC focused on proving that the CUPS concept was viable,” Schumann said. “Trees were grown mostly in containers, using hydroponics and very high-planting densities. A couple of Florida growers are using the CUPS method for grapefruit, although it’s too soon to know their results, Schumann said. Scientists are not yet recommending the intensive production system used at the CREC experiment for commercial CUPS, although one grower in Hardee County is already experimenting with hydroponics and container-grown grapefruits, tangerines and navels under cover, Schumann said. 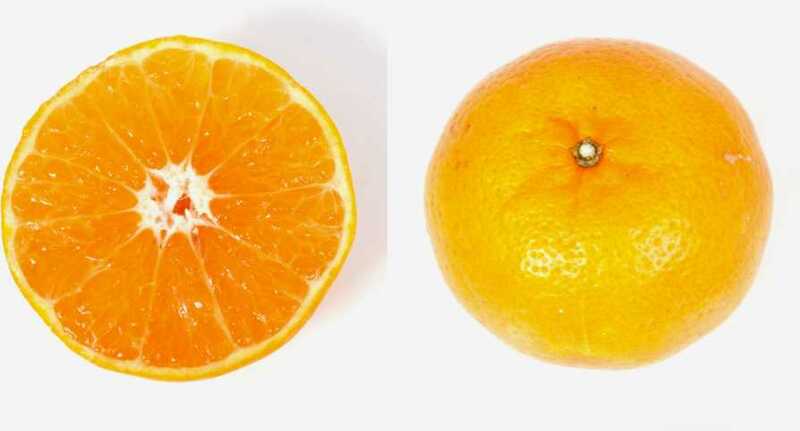 Commercial citrus growers in Florida hungry for something new will soon see a seedless mandarin orange variety that not only tastes good and is easy to peel, but also stays on the tree longer. 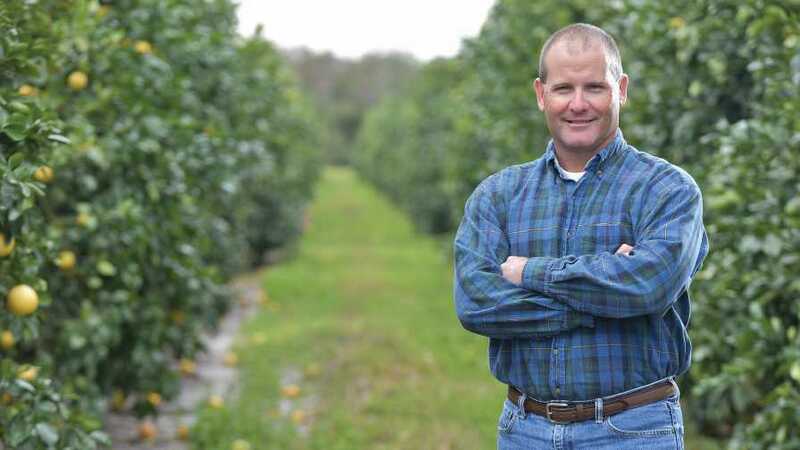 The last characteristic in particular is what makes ‘Marathon,’ an early season variety, stand out, say University of Florida citrus scientists. The selection is said to mature by October, though even earlier in some seasons and can hold onto the tree well into December. The fruit’s ability to hang onto the tree for an extended period led researchers to give it the ‘Marathon’ name. That extended hang time benefits growers if they have limited labor or want to sell their produce at a time when they’ll get their best prices, according to Fred Gmitter, a Professor based at the UF/IFAS Citrus Research and Education Center in Lake Alfred. “It’s unique in that it can hold on the tree for a long time and still maintain its fruit quality and postharvest shelflife,” he stated. In addition to its other attributes, the ‘Marathon’ mandarin is somewhat tolerant to citrus greening. While the new variety is not available in nurseries yet, Gmitter predicts growers can place orders for ‘Marathon’ trees later this year. Certified trees will be provided to licensed Florida citrus nurseries early this year for budwood increase. Another recently released UF/IFAS mandarin, ‘Bingo,’ came from the same breeding line. Since then, growers across the state have planted well more than 150,000 ‘Bingo’ trees with the first fruit on the way. The research leading to the development of both varieties was partly supported by grants from the Florida Citrus Production Research Advisory Council and the New Varieties Development and Management Corp.
Paul Rusnak is the Senior Managing Online Editor of Florida Grower, American Vegetable Grower, American Fruit Grower, and Greenhouse Grower magazines, all Meister Media Worldwide brands. Can New Bactericide Delivery Machine Save Florida Citrus? One of the keys to ensuring the effectiveness of bactericides that now are being applied to citrus is making sure the material gets into the tree to treat citrus greening (also known as HLB). 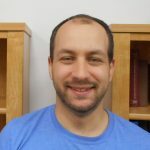 Ozgur Batuman, an Assistant Professor of plant pathology at the UF/IFAS Southwest Florida Research and Education Center, is leading a team of researchers trying to make the automated delivery system a reality to help growers deal with the disease. “The automated delivery system can be installed on any farm equipment and be operated by anyone who is driving – physically or remotely,” Batuman said in a news release. The person will be trained to use a joystick to control the arm that delivers the chemicals, he explained. To conduct the research, scientists will use a $3.4 million grant from the National Institute of Food and Agriculture, an arm of the USDA. The system would extend from a tractor or ATV to grab the tree trunk. Because the grip has many small needles, it can create numerous tiny openings in the tree. Bactericides can enter the tree through those small openings. These areas on the trunk with openings will be covered with a reservoir, such as a funnel or plastic balloon, that will hold the liquid containing the bactericide, Batuman said. The liquid then slowly enters through the holes of the trunk. This contrasts with traditional tree trunk injections in which a grower would use large, single-needle syringes to inject liquid materials in one spot. Most bactericide treatments are not very effective at staving off citrus greening because they were not directly delivered into the citrus vascular system, where greening — and its associated bacterium, Candidatus Liberibacter asiaticus (CLas) lives, he said. The therapeutic chemicals can kill or suppress the growth of CLas and can be used in greening-affected plants, Batuman said. The system also can help newly planted trees fight greening by controlling the Asian citrus psyllid, which can transmit said the disease. Huanglongbing (HB), also known as citrus greening disease, causes citrus trees to bear small, misshapen, bitter-tasting green fruit and often die within five years. Currently there is no cure for the disease, which is spread by a small brown bug — the Asian citrus psyllid. So far Australia does not have this bug or disease although it is lurking on our northern borders and the Department of Agriculture is on alert. However, it has entered the US where it is wreaking havoc. It was first identified in Florida in 2005 and since then has cost the US citrus industry billions of dollars in crop production and thousands of jobs. Among other solutions, scientists are exploring the possibility of breeding genetically modified trees that are resistant to the disease. 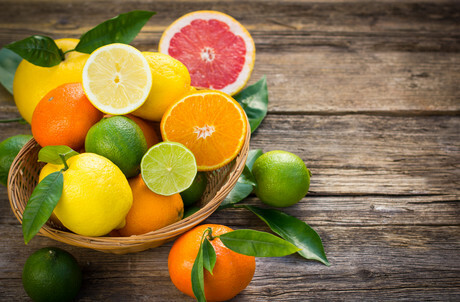 But given the controversy over the safety of genetically modified food, scientists need to know whether producers will adopt this technology and whether shoppers will buy and consume GM citrus fruit. A recent study, funded by the US Department of Agriculture, provides some encouraging answers. A representative sample of US consumers and conducted focus groups was surveyed to better understand American consumers’ attitudes about GM food and agriculture. About half of the 1050 people who responded to the survey had positive attitudes towards GM science, the researchers found. Nearly 37% of the consumers surveyed felt neutral about GM science and 14% had negative perceptions of it. Most of the people who were receptive to GM science were white males who were millennials or younger, the data indicated. They were highly educated — most held a bachelor’s degree or higher — and affluent, with annual incomes of $75,000 or greater. Women, on the other hand, constituted 64% of the group with negative feelings about GM science. Baby boomers and older adults were nearly twice as likely to fall into this group. People in this group also were less educated — about half reported some college but no degree. Since social contexts influence public opinion on contentious issues, the survey also assessed respondents’ willingness to share their opinions about GM science, their current perceptions of others’ views on the topic and what they expected public opinion about it to be in the future. The research team was particularly interested in exploring the potential impact of the ‘spiral of silence’ theory, a hypothesis on public opinion formation that states in part that people who are highly vocal about their opinions in public encourage others with similar views to speak out while effectively silencing those who hold opposite views. The findings have been published in the journal Science Communication. Florida citrus growers have always understood the importance of soil health and the positive influence of microbial activity and diversity in production. As citrus greening (also known as HLB) has spread, reducing production by more than 70%, interest in how these tiny organisms can improve root health is increasing. Research showing the disease, which is spread by the Asian citrus psyllid, can reduce citrus fibrous-root density by 30% to 50% before symptoms become visible above ground only intensifies the interest to learn more. Soil microbiology thrives best in soils that are higher in organic matter. The sandy soils of the Sunshine State have minimal water- and nutrient-holding capacity. Root systems reduced by citrus greening combined with sandy soils are a poor combination for tree health and ultimately citrus yield and quality. With that in mind, the Citrus Research and Development Foundation awarded Dr. Sarah Strauss, an Assistant Professor of soil microbiology with UF/IFAS, funding for a three-year study to investigate how citrus row-middle management could improve soil and tree health. As principal investigator, Strauss and fellow researchers will look at cover crops and how they can help build organic matter in soils and improve the environment for microbial diversity, beneficial bacteria, and other organisms to help retain moisture and uptake of nutrients. The crops also could help with weed control by crowding them out via competition. The study will evaluate a summer season and winter season cover crop planting. The summer mix will include buckwheat, brown top millet, sunflower, and sun hemp. The winter mix will include daikon radish, winter rye, and other crops. Nitrogen-fixing crops will be in the mix to provide a fertilizer benefit to the citrus. In Brazil, growers use a practice called eco mowing, where they sling the cover-crop clippings underneath the tree to create a compost. 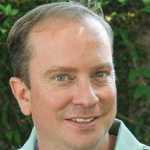 Brian Randolph, Production Director for IMG Citrus, is a believer in building organic matter and sustaining an environment for microbial diversity in soils. Recently, the company has put in new plantings in Lake County, FL. Given the sandy soil where the new blocks are going in, he says they first wanted to build up an organic base by applying 4 tons of treated compost per acre before planting, with a plan to add 2 tons per season for the foreseeable future. Randolph also likes the compost because it establishes a foundation for beneficial microbes to live in the soil and root zone. He supplements this with applications of microbes and other biostimulants. The number of commercially available microbial and biostimulant products is on the rise as the industry and growers learn how to better incorporate them into their production programs. When the trees are three-years old, Randolph will have sub-surface drip tape installed down the middle of the rows to apply water and fertilizer to support roots beyond the tree-trunk area. So how do you know cover crops and compost are making a difference? Strauss says she hopes the three-year research project will shed light on the question. One quick method is to dig around the trees and look for worms. Worms thrive in soil environments with good organic matter and microbial diversity. “Earthworms are a good sign,” she says. University of Florida Institute of Food and Agricultural Sciences researcher Xavier Martini recommends planting windbreaks on two or more sides of citrus groves. He gave this advice to growers at a recent Citrus Insect Management Workshop in Lake Alfred, Florida. Martini said windbreaks do a good job of keeping canker and HLB-spreading psyllids out of groves. 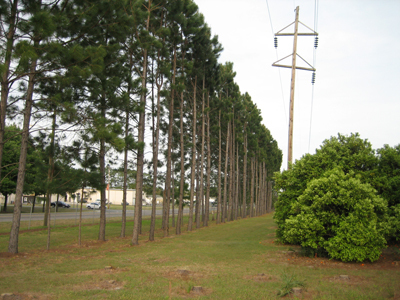 The trees also help prevent wind damage and soil erosion. Because Florida groves experience mostly winds from the east and west, Martini recommends using the organic wind barriers on at least those two sides. Martini, who works at the North Florida Research and Education Center, recommends fast-growing native plants that reach 40 feet in height. “Pine trees are good … I like pines a lot,” he said. He also mentioned redbay as a good plant to use as a wind barrier. Numerous other plants also make good windbreaks for citrus groves. Other characteristics of good windbreak plants are that they have long lives, are wind resistant and are tolerant of cold, heat and salt. Growers who plant wind barriers should ensure they leave enough room between the barriers and groves for tractors and other equipment to maneuver, Martini advised.